AISD student heads to Scripps National Spelling Bee in Washington, D.C.
Kealing Middle School seventh-grade student Pranathi Jammula won the Austin Regional Spelling Bee at the ZACH Topfer Theatre late March. She will represent Austin in the 2018 Scripps National Spelling Bee in Washington, D.C. The Austin Regional Spelling Bee went 12 rounds before Pranathi secured her victory. She correctly spelled "coriaceous"--resembling or having the texture of leather--for the win three and a half hours into the competition, placing first among 46 other competitors. Pranathi has participated in the bee program since third grade and has advanced to the regional level for four years. In 2017, she placed third at the Houston Public Media spelling bee. This year will be her first chance to compete in the Scripps National Spelling Bee. Pranathi's mother, Prasanna Jammula, said the entire family is excited for her win. "We are very happy to see Pranathi advancing to the Scripps National Spelling Bee. For sure, her hard work has paid off," Jammula said. "We want her to make Austin proud again on the national stage and know that she will step up the intensity to give her best in D.C."
Jammula says that Pranathi has been working hard for years to make her national competition dream a reality and that she has spent countless hours studying, practicing and quizzing with her sister, Triyatha, a third grader who also participated and placed fourth in this year's Austin Regional Spelling Bee. Prior to 2018, students advancing in the Scripps program in and around Austin had to travel to Houston to participate for a chance to advance to the national bee. According to the Scripps National Spelling Bee organization, Austin was one of the largest markets without its own bee, and a market that they had been hoping to foster for quite some time. The West Austin Chamber of Commerce decided to host Austin's first regional spelling bee this year after learning Leander ISD student and 2016 Scripps National Spelling Bee Co-Champion Nihar Janga had to travel to another city to participate in the regional bee. 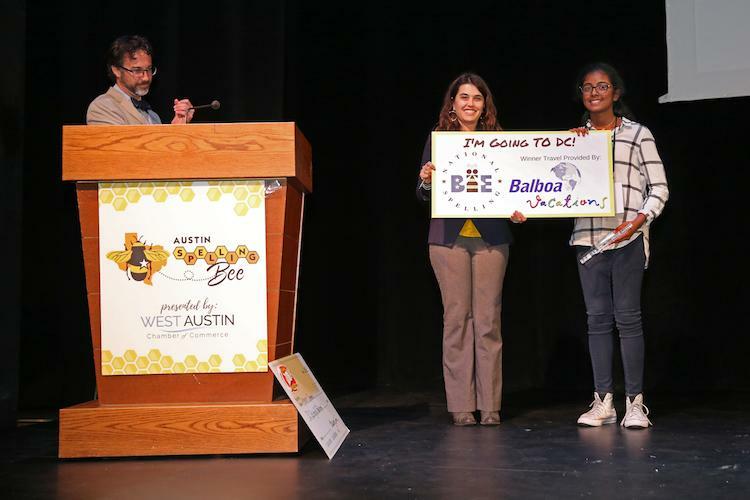 "We hope that having the opportunity to advance to the regional bee right here in Austin helps us increase interest and participation in the program here locally in the coming years," said West Austin Chamber of Commerce President Morgan Briscoe. "From elementary school on up, we want to help promote the love of spelling, language and learning. Pranathi's story is one of dedication and perseverance and we can't wait to cheer her on at nationals." The Scripps National Spelling Bee's Bee Week will take place May 27-June 1 at the Gaylord National Resort outside of Washington, D.C., with the final round televised May 31 on ESPN. The West Austin Chamber of Commerce exists to strengthen and improve the West Austin Chamber business community to promote the economic well-being of all citizens. As part of this mission, the chamber provides opportunities to educate and to advance the future generation of local business leaders. The chamber is a member-driven nonprofit organization and hosts a variety of member-focused and community events including the annual Summer Camp Fair and Lemonade Day Austin. The Scripps National Spelling Bee is the nation's largest and longest-running educational program. The purpose of the Scripps National Spelling Bee is to help students improve their spelling, increase their vocabularies, learn concepts and develop correct English usage that will help them all of their lives.